It’s time to unleash the beast within! On the tail of the Rulers of the Laguz banner comes yet another Grand Hero Battle – this time featuring our first-ever beast opponent, Naesala. Thankfully, this map unto itself is far from the worst we’ve encountered, featuring no reinforcements and relatively few tricky foes to deal with. Aside from the king of Kilvas himself, who has a charged Special and can potentially have 3 movement, the enemies you’re facing are pretty straightforward. As always, careful use of buffs, stringent positioning, and taking initiative to deal the first blow will serve you well. As per usual, even if you’re making use of a striker, you’ll likely want to employ tanks in order to establish chokepoints and KO foes on Enemy Phase. While a multi-striker/refresher approach can work here, tanks are also an option that can help you keep your higher firepower units safe in the back lines. Since they simply have more stat points to work with, armors are almost always effective tanks. 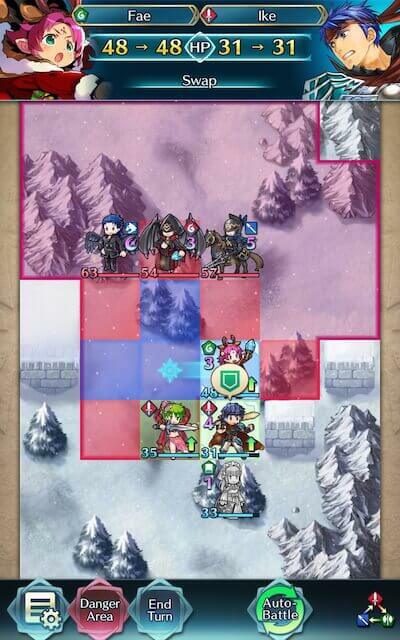 Zelgius, Winter Tharja, Halloween Myrrh, Legendary Tiki, Brave Hector, Surtr, and Winter Fae are able to hit hard very upon attacking and counterattacking, especially if they’re making use of Bold Fighter, Quick Riposte, or Vengeful Fighter, but really, any sufficiently buffed armor will likely do the trick. Black Knight is a powerful F2P option due to his powerful semi-exclusive Special, Black Luna. Infantry F2P options really are functionally limited to Legendary Ike, whose native Warding Breath grants him accelerated cooldown and extra Resistance, and Fjorm, who can easily tank ranged damage due to her exclusive Special, Ice Mirror. Calvary tanks are similarly limited -- Xander and Camus may struggle, but may survive if under the effects of Ward Cavalry. Winter Fae’s hefty Res, good Defense, and ability to follow-up on Enemy Phase with Vengeful Fighter (while gaining extra cooldown) make her an excellent choice of tank. Since Naesala represents one of the biggest threats on this map, taking advantage of his status as a flier is a great idea – but archers are almost always a good choice of striker, especially if they make use of a Brave Bow. Their ability to overpower most foes and deal hefty damage with a timely Special activation means they’ll serve you well in breaking through enemy lines. Do note that since Naesala and the red dragon flier are only reachable by flying over the mountains yourself, flying archers like WF Hinoka, Summer Takumi, and NY Fjorm will be particularly useful here. Otherwise, Brave Lyn, Halloween Jakob, Setsuna, and Klein are potential strikers you may want to use, with a special mention going to Brave Lyn given her potential F2P status. Really, any Brave Bow archer with adequate support or Skill investment should do the trick though. Colored archers like Legendary Lucina, Legendary Lyn, and Halloween Niles may perform well, but will have to watch out for the Weapons Triangle; which is a distinct disadvantage when compared to their colorless counterparts. Alternatively, melee Brave users are able to hit foes twice without retaliation, and may even quad hit if they outspeed an enemy. Cherche, Cordelia, and Elincia are all great melee Brave users who can make excellent use of class-specific buffs, and when equipped with Hit and Run or Drag Back they are able to retreat once attacking. WT Reinhardt may also prove useful due to his weapon granting him follow-ups regardless of phase. Brave and Blade tome wielders can also serve to be useful if your team composition provides them with the appropriate buffs, though other mages can also be powerful strikers. Tharja, Reinhardt, Tailtiu, Ishtar, Ophelia, WT Olwen, Lewyn, SF Nino, and Nino are potential options here, especially if they are equipped with a Breaker skill to add to their coverage. Julia and Deirdre are also very useful due to their ability to OHKO the blue dragon (with or without support), though most green mages equipped with Triangle Adept should be able to do the same. 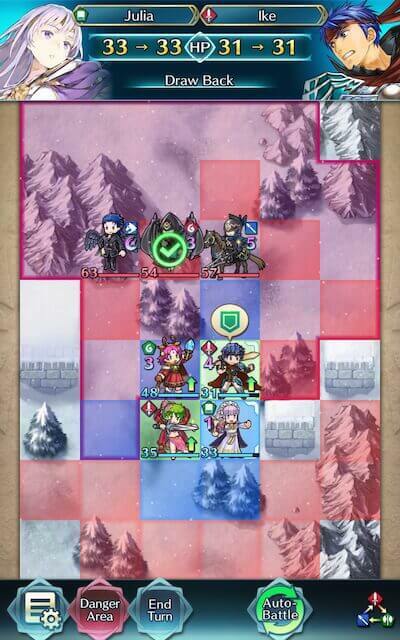 Julia once again is able to prove her worth on this map due to the effective damage she’ll deal to dragons and the color advantage she has over Naesala. As units that offer extra utility, supporters typically fit one of the above roles while also providing some sort of assist to your other units. Buffers, debuffers, and drivers all can play a valuable role in your team composition by making use of their incredible utility. Because of Skill Inheritance, any unit can be a buffer with enough investment -- many Drives, Spurs, Hones, Fortifies, and Dual Rallies are readily accessible on 4 star units, and can be further stacked with seals for maximum coverage. Tactics seals are also easily accessible and provide a hefty +6 boost to one stat. Notable options who natively provide buffs through their exclusive weapons include YT Olivia, Performing Azura, Brave Veronica, Eirika, and Ephraim, while Brave Lucina, New Year Corrin, and New Year Azura are able to stack Drives through theirs. That isn’t to say that offensive juggernauts can’t provide team support, though -- class specific buffs (like Hone Cavalry or Fortify Fliers) are easily accessible and incredibly potent. Considering that most offensive units don’t make heavy use of their C-slot Skill anyways, they can inherit these Skills to boost the team’s firepower. Some units are able to support both themselves or their allies at the same time. Legendary Tiki, Helbindi, and Brave Veronica are examples of units who buff both themselves and their allies when fulfilling certain conditions. Debuffers can make use of weaponry, Skills, or Seals to help de-fang the enemy team and make them significantly less threatening. Ploys, Chills, and Smokes especially are wide-reaching and potent debuffs that can easily turn the tide of the battle at a pivotal moment. Lilina and Soren have a Chill effect on their refined weapons, while Male Morgan has a unique buff/debuff dual effect on his. Dagger units also inflict debuffs when they attack, which can be very useful to cut through an Infernal foes’ inflated HP. Among Daggers, however, Eir is particularly unique – her status as a flier grants her excellent mobility and access to unique support Skills like Guidance, plus her kit perfectly synergizes with her unique weapon to grant her both offensive prowess and excellent support utility. Not only does she debuff foes within 2 spaces of the target she attacks (and the target itself if she does not KO them), her C-slot Skill Sparkling Boost provides some much-needed healing at the start of every turn to the most damaged unit on your team – excluding Eir herself. She’s a great option if you’re finding the mages a little tough to deal with or just generally aren’t sure how to fill a slot on your team. Before you even consider your opening moves, it’s important to understand how beast units function. If Naesala starts the turn next to a beast (not an issue) or dragon ally, he’ll transform into his beast form and gain 1 extra movement. Because of this, it’s a good idea to be acutely aware of the unit Naesala is beside at all times – otherwise he may transform and target a unit you thought was safely outside of his range. If you’re a dedicated reader of these guides, you’ll know by now that most of these maps are won or lost before they even start. While it may be tempting to jump right in, knowing (and loving!) your enemy will help you not only choose your units, but also figure out where to begin. If you don’t have a flying archer to attack Naesala or the red dragon flier over the mountains, you really only have one avenue to get this map moving – tanking Naesala himself isn’t a great idea considering his charged AOE Special. That means your best bet is targeting the blue dragon with a striker and Repositioning/refreshing them so they’re out of danger, or potentially tanking red physical damage, blue magic damage, and green magic damage all within the span of one turn. This will be a difficult feat for most units (barring Fjorm), though with enough buffs a tank may perform decently well here. Colorless units who can counterattack regardless of range (either through weaponry like Legendary Robin or Skills like Close Counter) may be a good choice here, but will need support to overcome their lack of color advantage. 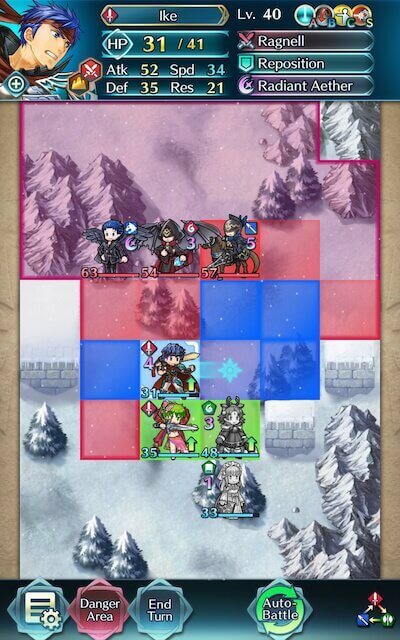 Taking a charged AOE Special to the face is hardly advisable in the best of circumstances – plus, Naesala’s Flier Formation means you’ll have to take damage from all 3 colors as well if you try to tank him. That doesn’t mean that taking down the blue dragon will be particularly easy, however. Due to their kit of Distant Defense and Dull Ranged, you won’t be able to rely on visible buffs from Hone and Wave Skills to power through this foe’s inflated HP – so you’ll have to seek to KO them through other means. Julia and Deirdre are great choices for this role due to their color advantage and the effective damage to dragons they deal, but any green mage will likely do the trick, especially if they’re speedy and/or make use of Triangle Adept. Thankfully, Julia doesn’t rely on Speed or Attack buffs to KO this foe, but if she needed a little help, Drives could give her the boost she needs. From there, your best bet to complete this map as painlessly as possible is establishing a chokepoint with a tank that can counterattack regardless of range. Bulky reds perform exceptionally well here, as the red sword cavalry isn’t particularly threatening and the green mage cavalry possesses a color disadvantage against them. Legendary Ike is able to establish a chokepoint here by repositioning Julia to safety. Even if one of your units has middling Speed, oftentimes you’ll find that with a bit of support, they’re able to perform follow-up attacks and KO foes they would otherwise have to deal with later. 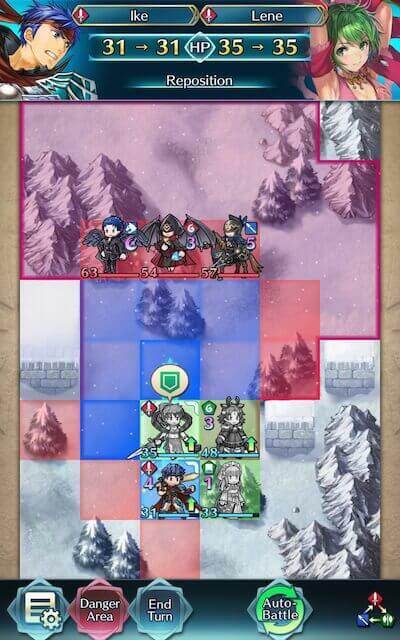 In Ike’s case, Lene’s Drive seal when combined with Julia’s Hone actually grants him enough Speed to KO the red sword calvary on Enemy Phase – though Lene must be positioned carefully in order to ensure Ike is under her Drive’s effects. Moving Lene up here may make positioning on the next turn a little more difficult, but it ensures Ike is able to follow-up on the red sword cavalier. Even though Dual Rallies have become the assists of choice in the Arena, movement assists are still valuable tools that can help you circumvent a variety of different positioning issues. Chaining movement assists together results in you being able to move your units in a variety of new and interesting ways, and can often result in the difference between victory and defeat. From there, Fae swaps with Ike, putting her only within the range of the blue cavalier. And he repositions her out of the range of the red dragon and Naesala – remember, since he’s next to a dragon ally, he’ll transform into his beast form and gain 1 extra movement. Because Naesala’s charged AOE Special will lay down the pain on whomever it activates against, the easiest way to avoid it is to simply attack him with a ranged unit. If you can’t net the KO due to not being able to follow-up and not having a refresher handy, than consider attacking him once with a ranged unit then once with a melee unit. He’ll still activate Blazing Wind, but since AOE Specials deal non-lethal damage, you should be able to finish him off. Finishing Naesala off shouldn’t be too difficult with your ranged striker, but worst case scenario you can attack him with a melee unit to finish the job. Winter Fae is a complete tank with her Glittering Breath+, moreso once Def refined. She must be protected so she can go "Stompy! Stompy!" at all times. Eirika is the key supporter with Joyous Lantern+, Atk Bond 3, staying next to W!Fae to activate Def/Res Bond on her, AND even tanks the Green Flier on Phase 2. Black Knight is there just for Ward Armor support for Fae. Anyone with Ward Armor will work. Ophelia's just there because stars.